Since 2003 Why am I seeing the old web design? More recently, on new pages and stories, we are "coming up to speed", and listing the credits and the bottom of the article. Barrere, Albert and Leland, Charles; A Dictionary of Slang, Jarcon & Cant; Ballantyne Press; London, England, 1889. Bartlett, John Russell; Dictionary of Americanisms, Bartlett and Welford, New York, NY, 1848. Boessenecker, John; Badge and Buckshot: Lawlessness in Old California; University of Oklahoma Press; 1988; Norman, Oklahoma. Chittenden, Hiram; The American fur trade of the Far West, By Hiram Martin , Volume II, Francis P. Harper, New York, 1902. Dawson, Charles; Pioneer Tales of the Oregon Trail, Volume 1, Crane & Co., Topeka, Kansas, 1912. Erdoes, Richard; Saloons of the Old West; 1979, Knopf: New York, NY. Flanagan, Mike; The Complete Idiot's Guide to The Old West; 1999; Alpha Books, Indianapolis, Indiana. Flexner, Stuart Bert; I Hear America Talking; 1976, Simon and Schuster, New York. Gordy, William F.; American Leaders and Heroes; Charles Scribner's Sons, New York, 1903. Green, Jonathon; Cassell's Dictionary of Slang; Wellington House; London, England, 2000. Hyde, William and Conrad, Howard L.; Encyclopedia of the History of St. Louis, Southern History Co., NY; 1899. Hufsmith, George W, The Wyoming Lynching of Cattle Kate, 1889 , High Plains Press, Glendo, Wyoming, 1993. Jones, Lee; Winning Low Limit Hold'em; Conjelco, Pittsburg, PA, 2000. Kildare, Maurice, Dead Outlaws Loot, True West Magazine, February, 1967. McLelland, Dr. Dennis; The Avenging Fury of the Plains, John "Liver-Eating” Johnston, Publish America. Murray, Earl; Ghosts of the West, 1994 , Tom Doherty Associates, Inc., New York, NY. Pinkerton, William A.; Highwaymen of the Railroad ; The North American Review; Volume 157, Issue 444, November, 1893; University of Northern Iowa; Cedar Falls, Iowa. Rochlin, Fred and Harriet; Pioneer Jews: A New Life in the Far West; 2000; Houghton Mifflin Books; Boston, MA. Roosevelt, Theodore; Ranch Life and the Hunting-Trail; 1888; The Century Co. New York. Rule, Leslie, Coast To Coast Ghosts, 2001, Andrews McMeel Universal Company, Kansas City, MO. Slatta, Richard W.; The Cowboy Encyclopedia; 1994, ABC-CLIO, Inc., Santa Barbara, CA. Thrapp, Dan L.; Encyclopedia of Frontier Biography, Volumes I-III; University of Nebraska Press, 1988. Wilson, Michael; Great Stagecoach Robberies of the Old West; Morris Book Publishing, 2007. Create Your Medicine Bag - A Native American medicine bag or medicine bundle is a container for items believed to protect, provide guidance to, and give spiritual powers to its owner. This ancient concept has been used around the world for thousands of years. Among the indigenous peoples of America, most medicine bags hold items such as animal furs, special stones, traditional or alternative healing items, or anything that means something to the owner. When you create a medicine bag and wear it close to your heart you are connecting with your spiritual self. 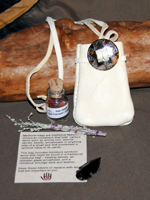 Choose your bag and fill with items you might find important to you such as healing crystals, arrowheads, balms, symbolic sage bundles, art, feathers, prayer blessings and more.